KURT SENN “Our friends many, our troubles few; it’s hard to believe our four years are through. We’ll eventually leave, better off than when we came; we can never look back, things will never be the same." Kurt Senn’s prophecy in his Grissom High School Yearbook of 1984 is stylishly written, but after more than three decades he can’t remember if he penned those lines himself or borrowed them from another source. Not that it really matters. Each verse accurately described his high school years and served as a clear predictor of his future accomplishments in life, which are many. Senn’s Senior Yearbook also included these notations from those high school years, starting with 1 as a freshman and ending with 4 as a senior: Soccer 1-2-3-4, Basketball 1-2-3-4, Baseball 1-2-3-4, Football 3-4, Most Outstanding 1-2, Class Favorite 3-4, National Honor Society 3-4. Also: German Honor Society; All-City in Football, Basketball, Soccer; All-Region in Basketball; AP Calculus; DAR Good Citizenship Award. Notice, soccer was listed first. “I’ve been blessed in so many ways," says Senn, who tonight be comes the first soccer player from the city of Huntsville to be inducted into the Huntsville- Madison County Athletic Hall of Fame. “Being chosen for this Hall of Fame is such an honor. Growing up when I did, I feel that I was a part of the early years of soccer’s popularity in the state of Alabama. It has really exploded over the last 30 years or so. Being a part of bringing attention to this wonderful sport adds a lot to how special this is to me. I played alongside some incredible athletes and friends, and for some great soccer coaches in high school in those early years – Dr. Allen Gary, Terry Graff and Phil Holladay." Kurt Senn was only 5 when the international sport of soccer was introduced to Grissom High School in 1971, two years after the school first opened its doors. A student named Jerry James organized a dozen or so fellow devotees and formed the Grissom Soccer Club Team. Dr. Gary, then a solar physicist at NASA/Marshall Space Flight Center and later a research scientist at UAH, adopted the club team in 1973 and became the first high school soccer coach in the city of Huntsville. Grissom joined the Dixie Soccer Conference in 1974 and won the first league championship the following year. It was the genesis of something big: Since the Alabama High School Athletic Association first sanctioned s occer as a varsity sport in 1991, Grissom has won eight AHSAA state soccer championships (1992, 1994, 1996, 1997, 1998, 1999, 2000 and 2010). Only John Carroll of Birmingham, with 10 state titles, has more. Senn developed his interest in sports while he, his older brother and their parents were following the father, Bob Senn, on U.S. Army assignments both at home and abroad in the 1960s and ‘70s. During their travels, Kurt first played soccer with young Jordanian and Turkish friends in Amman, Jordan. After the family settled in Huntsville in 1977, he played basketball, club soccer and ran track at Mountain Gap Middle School, where he thrived under the steady hand of basketball coach Randall Parker. “He taught me a great deal about discipline, respect, and being on a team," Senn said. Later at Grissom High, he excelled in soccer, basketball and baseball for four years and in football as a kicker for the last two years. Those junior and senior years were hectic from a time-management standpoint in the Senn household. In that era, high school football and soccer in Alabama were both played in the fall, wioverlapped in all three sports. Kurt remembers one Friday when he practiced soccer for an hour, attended preseason basketball workouts for an hour, then went to Milton Frank Stadium that ni ght and punted in a football game. Then there was the time when the Grissom soccer team played at Altamont of Birmingham. When the game ended at 5 p.m., Senn jumped in the car and drove 70 miles to join the football team for a game in Decatur. He arrived just in time for a quick warmup five minutes before kickoff. It was all worth it in the end. 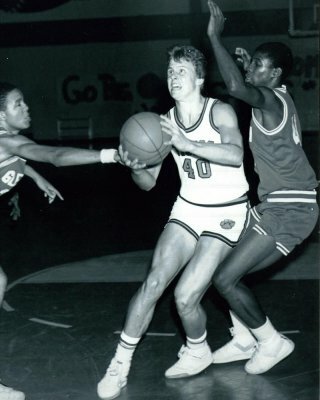 He was first-team All-City in soccer, football, and basketball in 1983-84, and was named “Huntsville Athlete of the Year" as a soccer midfielder that same school year, becoming the first soccer player from a city school to receive that honor. Through it all, he was also a consistent academic star in the classroom, graduating at the top of his senior class at Grissom. “There’s a certain amount of discipline involved in balancing sports and academics," said Senn. “But I don’t recall struggling with making academics a priority because my mom and dad were clear with their expectations. Like many of my friends, I had to practice pretty much the year around. But I made sure my studying was done before having free tine. Of course, life was simpler back then. No internet, no smart phone. I don’t think we even had cable TV until I went off to college." His parents, Bob and Nina Senn, always supported both Kurt and older brother Eric to the fullest. “They were there for me at every single turn," Kurt said. “They never missed a game, and there were a lot of games. My dad was the first coach I ever had (in Little League baseball). He’d keep my stats up in the stands, whichever sport I was playing at the time. Both parents were always positive and encouraging. Without them, I wouldn’t have had much success in life. Growing up in a Christian home, where we went to church and Sunday School every Sunday and ate meals together as a family and talked about everything, was an incredible blessing." After high school, Senn became a student-athlete in the truest sense at Birmingham-Southern College, where he played soccer for four years under famed coach Preston Goldfarb. As an incoming freshman, he received the school’s prestigious McWane Award, a full academic scholarship plus a yearly stipend for additional study and travel, valued at $80,000. Following graduation from Birmingham-Southern, Senn went on to Medical School at the University of Alabama in Birmingham, graduating with honors in 1992. He chose to specialize in anesthesiology in his residency program and has been on the physicians’ staff at Shelby County Hospital in Birmingham as an anesthesiologist since his graduation from UAB. (C)Copyright 2015 by Huntsville-Madison County Athletic Hall of Fame. Website developed by Grabber Green, Inc.